Third quarter global solar installations in 2013 reached 9 GW, according to a recent report. NPD Solarbuzz Quarterly said demand increased 6% compared to the second quarter, while advancing 20% above a year earlier. Price stabilization provided some underlying support in the third quarter, according to analysts. “The record levels of mid-year demand in 2013 have been critical to the overall recovery of the solar PV sector,” said NPD Solarbuzz senior analyst Michael Barker. Fourth quarter PV demand is expected to remain strong, reaching between 10-12 GW. China and the US will take half of the further gains, the report noted. Revenues for solar PV end markets are targeted for $21 billion in the last quarter of 2013, and $65-$75 billion by year’s end. That compares to $68 billion in 2012 and $92 billion two years ago, when system prices were higher. NPD Solarbuzz is the first report to come out about third quarter PV installation numbers. IHS still has not released for this period. 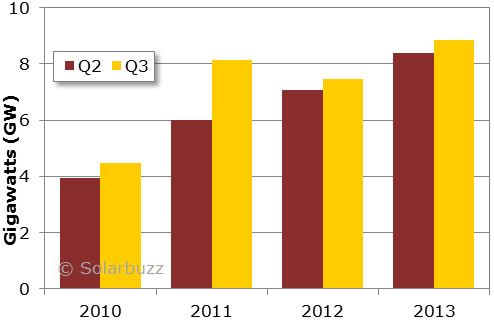 However, it did recently report 2013 second quarter global solar installations were 8.5 GW, up from 7.1 GW in the first. This article, Third Quarter 2013 Solar PV Installations Reach 9 GW, is syndicated from Clean Technica and is posted here with permission.